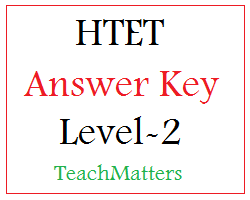 (Last Updated : 20.11.15) Download HTET Level-2 Answer Key 2015 of Social Studies. HTET TGT exam was held on 15 November 2015 for for Level-2. Official HTET 2015 Answer key for Level-2 has been published here for download. We have provided HTET Level-II answer key 2015 for all compulsory parts with answer option and solution which can be used for all sets - Set- A, B, C, D & E. Here is HTET TGT Social Studies Answer Key 15.11.2015. BSEH uploaded Official HTET TGT Answer Key of HTET Nov. 2015 on the official website i.e. www.hbse.ac.in or www.htet.nic.in before the Result of HTET 2015. You can download here official answer key of HTET Level-2 exam 15.11.2015 for Social Studies Set-E. This HTET Level-2 Answer Key of Social Studies 2015 Set-E can also be used for other sets of the same. All HTET 2015 aspirants are advised to see other parts of Answer key of HTET 2015 for level-2 (TGT) whose links are given below the answer key. See HTET Answer Key 2015 for level-2 part-4(b) Subject Social Studies below. HTET Answer Key published here are tentative & unofficial. For other sets - Set-A,B,C,D,E use this answer solution or see complete key here. Answer key will be updated* at regular interval, so visit this page regularly. Don't forget to share it with your friends on social media.